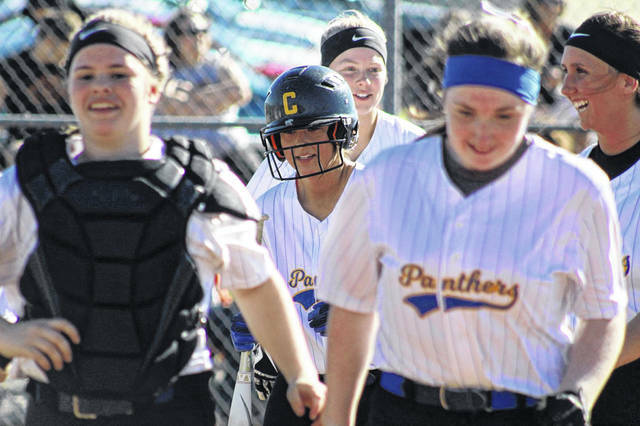 Clay’s Cassidy Wells heads to the dugout after hitting a home run in the second inning of Tuesday’s 7-4 loss to Waverly. Waverly’s Zoiee Smith gets set before a pitch during the Tigers’ 7-4 win over Clay Tuesday evening. Clay’s Lila Brown throws a runner out from her second base post during the late innings of Tuesday’s 7-4 loss to Waverly. 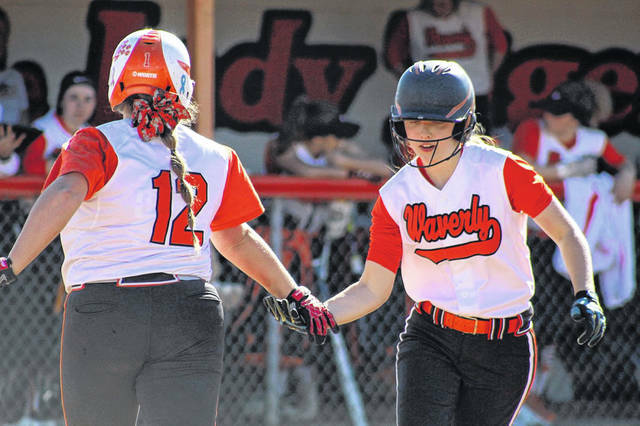 Waverly’s Haley Tarlton shakes hands with Kirsten Blair before pinch-running Tuesday night. The Tigers handed Clay its first loss this season by a 7-4 final. WAVERLY — No loss is a good loss. But if Jason Gearhart is going to take one, he’d rather it resemble the one his Panthers took Tuesday evening. Entering the night undefeated, Clay (10-1) traveled to Waverly and allowed the Tigers (7-1) to score five runs in the bottom of the fifth inning — the final blow in a 7-4 non-league loss. But Gearhart is looking at the positives … and he’s not making excuses, either. 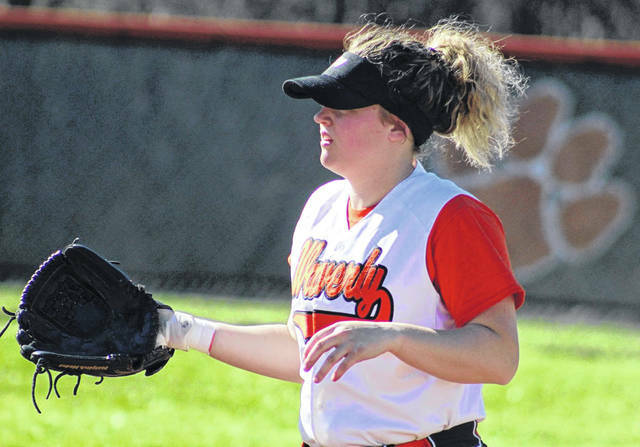 The Panthers were without veteran pitcher Hannah Oliver, who was out sick. So the entire pitching load was placed on the shoulders of freshman Preslee Lutz. Lutz took the loss, but threw six innings, allowed 10 hits and struck out nine. While it may not have been her best performance, she showed glimpses of Clay’s future in the circle. Meanwhile, Waverly’s duo of Hailey Robinson and Zoiee Smith tormented the Panthers’ defense. Combined, the two finished 5-for-7 with a double, a triple, three runs and three RBIs. Robinson got things started, logging an RBI single in the first to score Emma Bellaw and give Waverly a 1-0 lead. In the top of the second, Clay’s Cassidy Wells continued a torrid hitting streak by going deep, opposite field style, tying the game 1-1. In the bottom of the third, the Tigers retook a one-run lead when Smith scored on an RBI single from Bellaw. Clay answered again during its next at-bat when Wells singled, stole second and eventually scored on an error. The Panthers then took their first lead of the evening in the fifth at 4-2 when Jensen Warnock tallied a sacrifice fly and Wells singled to knock a run in. But in the bottom half of that inning, the wheels fell off the wagon. Smith singled and Bellaw doubled, scoring Smith and cutting the deficit to 4-3. Bellaw then scored on an RBI single via Kirsten Blair to the tie the game. With runners on first and second, Robinson lined a bases-clearing triple down the right field line, making it 6-4. She’d later score on a fielder’s choice, producing the night’s final. Robinson led the way at the plate, finishing 3-for-3 with a double, a triple and three RBIs. Smith was 2-for-4 with two runs and Bellaw finished 1-for-3 with two runs and two RBIs. In the circle, Robinson got the win by throwing three innings, striking out four and surrendering two earned runs. 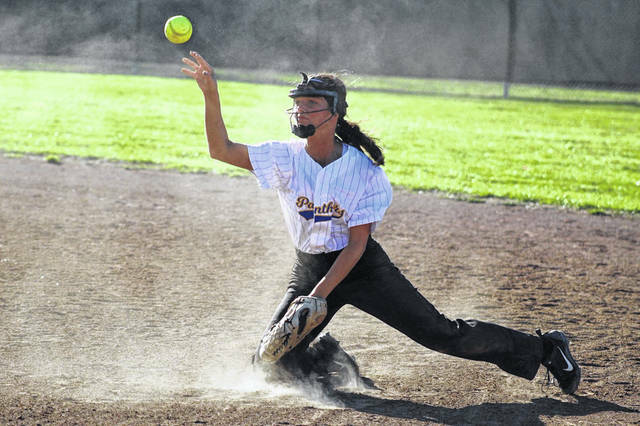 Her sister, Hannah, earned the save while throwing four innings and whiffing seven. Wells ended the day at 2-for-2 with the homer, two runs and two RBIs while Lila Brown was 2-for-4 at the dish. The Panthers also got a 2-for-2 day out of Ryanna Bobst, who also scored a run and stole a base. Clay is back in action Thursday night in an SOC I showdown at undefeated Notre Dame. The Tigers get back to business Wednesday evening at South Webster.